Our commitment is to respect your needs and your time, and to perform a timely, neat, cost-effective, and pleasing installation. Planning and consultation on such projects. 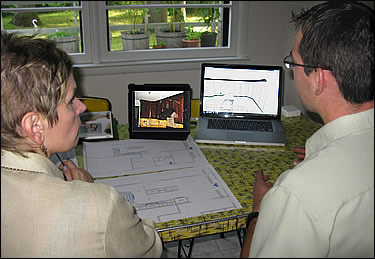 We listen very carefully to your ideas and use our experience to develop them into a plan in which you will take pride. 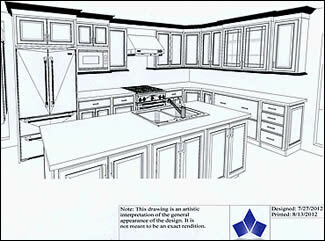 Preparation of detailed designs and specifications. 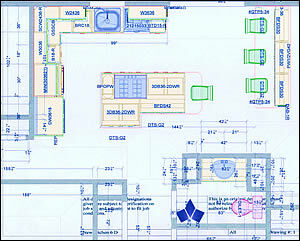 Depending on the task, we may present computerized plans, pictures of available items, and printed plans, as seen above. There are many elements that need to be brought together to assure that the project attains coherence. Project management for renovation jobs, including coordination of our staff and other contractors such as plumbers and electricians. Timing and sequencing can be critical to getting jobs done on time and with minimal disruption. Providing required installation materials, such as granite countertops, tile, plumbing and other fixtures, flooring, cabinets and kitchen equipment. We have established relationships with key providers of high quality materials, and will assist you in making selections at showrooms. Installation tasks, including detailed carpentry, stone and tile work. Our attention to detail and understanding of how things work after we're gone are important to a fine installation. We follow through to the last wipe and final cleanup! 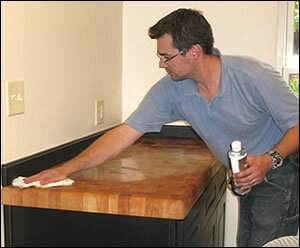 Other skilled home improvement tasks. Questions? We're happy to discuss your needs. Contact us here.